BBA - 3-year full time program with specialization - Marketing, Finance, HR, IT, IB, Banking and Insurance, Event Retail and Hospitality Management. Bharati Vidyapeeth, the parent organization of this University is one of the largest educational organizations in the country. It has 180 educational units under its umbrella including 80 Colleges and Institutes of conventional and professional disciplines. The candidates who have appeared at the qualifying examination are also eligible to apply provided they complete their exam including practical Examinations, viva/assignments on or before the day of admission to the institute of their choice. Such candidates will have to produce marks statement at the time of admission. The admission of student, will remain provisional until the other necessary certificates in original, are submitted to the institute. The last date to submit all the certificates (except statement of marks) in original shall be August 2019, if certificates are not submitted by the said date or the eligibility is not granted, the admission would automatically stand cancelled. A Candidate desirous of seeking admission to BBA/BCA Programme should fulfill the minimum eligibility condition as stated in point no 3, above. 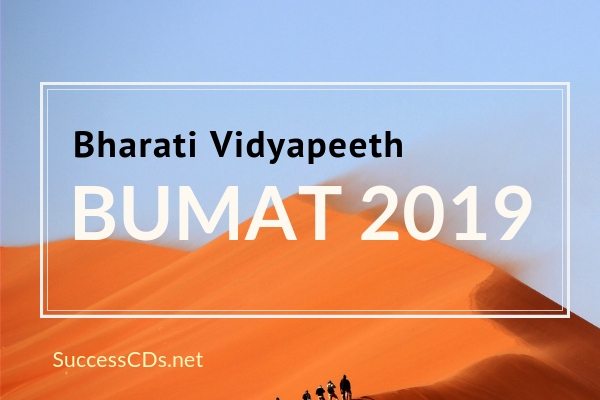 He/she must have appeared for the BU-MAT 2019 Test, [Written Test] conducted by Bharati Vidyapeeth (Deemed to be University), Pune at designated centres. Candidate shall be offered admission on the basis of his/her rank in the final merit list and availability of the seats for a particular program at a particular Institute of the candidate's choice at the time of counseling and admission in the concerned Institute. Mere appearance in the entrance test and inclusion of name in the merit list does not confer any automatic rights to secure admission to the program offered by the institute. The selection and admission to the program is subject to fulfilling the eligibility criteria. The B-MAT 2019 Test will be held at Pune, New Delhi, Navi Mumbai, Karad, Kolhapur, Sangli, Solapur, Lucknow, Patna, Chandigarh, Kolkata, Jaipur, Indore and Bhopal. The test centres gates will open 20 minutes before the exam commencement. Therefore, try to reach at least 30 minutes before. You will be expected to grab your seats at least 10 minutes before the test. A candidate desirous of appearing for the BU-MAT-2019 entrance test is required to complete the prescribed online application form and submit to the University along with entrance test fee. The candidates should strictly follow the instructions given in the website while filling up the application form online and must read the instructions carefully before filling up the online application form. The Admission Office - Bharati Vidyapeeth University, Bharati Vidyapeeth Bhavan, 02nd Floor, Common Entrance Test (CET), Dept. LBS Marg, Pune-411030 (Tel. : 020-24325510-09). Admission Officer - Institute of Management and Entrepreneurship Development (IMED), Bharati Vidyapeeth Educational Complex, Paud Road, Erandawane, Pune-411038 (Tel. : 020-25431060, Web: imed.bharatividyapeeth.edu).